Concentrated Poverty: Recession in Suburban America. Over a ten-year span, the number of Americans in poverty has grown by 12.3 million reaching a historic high of 46.2 million. By the end of 2010, over 15% of the nation’s population lived below the federal poverty line—$22,314 for a family of four in 2010. At least 2.2 million more Americans, a 33% jump since 2000, live in neighborhoods where the overall poverty rate is 40% or higher. Housing bust and the mass loss of manufacturing and auto industry jobs during the two recessions in the study period hit the Midwestern and Southern metro areas the hardest. 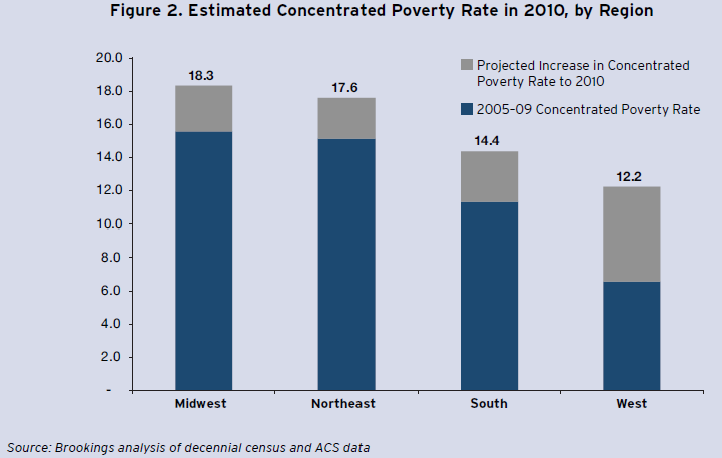 Midwest saw its concentrated poverty nearly doubled from 2000 to 2005–09, while Southern metro areas experienced an increase by one-third. Black residents continued to comprise the largest share (45%) of the population in these extreme-poverty neighborhoods, and over two-thirds of residents had a high school diploma or less. The Census Bureau already released its result in September that not only showed the number of people living in poverty was the highest in the 52 years, since the agency started tracking the statistics, but also that U.S. household income fell to its lowest level in more than a decade in 2010. Bloomberg noted that the Census data also showed roughly one in 16 American workers made less than half the poverty rate in 2010, a 12.6% increase from 2007.This just illustrates how deep this recession has cut into the American middle class. Traditionally, the white-picket-fence suburb has long been associated with the social status of upper-middle-class affluence. The migration of poverty into the suburb is just one of many examples that the Great Recession and the staggering number of the long-term unemployed has created yet another New Normal in America. In the medium term, although the U.S. economy might be able to escape a full blown double dip recession, a slow crawl out of the deep hole from the Great Recession and the 2008 financial crisis is to be expected. Some in the international community believe this global economic downturn originated in the U.S. That might be partly true, but it also means the U.S. is ahead of the curve in terms of recovery. Unfortunately, it also means some crises such as the Europe sovereign debt are just starting or waiting to unravel, which could impede the already very tepid recovery in the U.S.
For now, all eyes of world markets are fixated on Europe and mostly have priced in an eventual orderly resolution of the sovereign debt crisis which has been going on for well over a year. Based on that expectation, the U.S. should be able to stay on track, and corporations would start hiring and investing on a larger scale again. The jobless rate, which already saw a 0.1% reduction in October, would start to recede and hopefully help at least halt and/or improve the poverty stricken population. 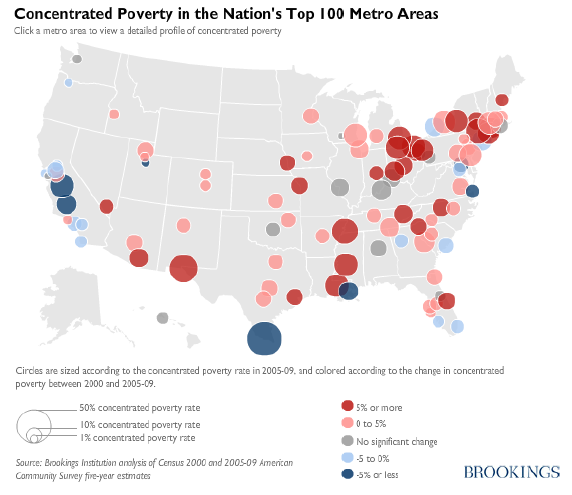 However, we think some high poverty areas in Brookings study such as Detroit, Michigan and Chicago, Illinois, most likely would be slow to improve as these cities have gradually lost the competitive edge that brought their prosperity decades before. For example, many good paying auto-related jobs have now moved out of the once dominant Motor City area, and into other states with more favorable business friendly policies. So without a major overhaul of tax, labor and business incentive related policies at the local and state levels. these areas are unlikely to see as much improvement. Related Reading – A Lost Decade into The Great Middle Class Poverty?